The beautiful ceramic ball cup from Bunzlau with approx. 350 ml drinking volume is decorated in incredibly many Bunzlau patterns by the pottery Ceramika Artystysczna in elaborate handwork. Brushes, sponges and stamps are used. 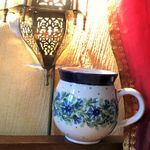 All these unique Bunzlau ornaments can be found in the online shop bunzlauergrosshandel.de on various Polish Pottery items - small jewelery, sugar cans, closet buttons, espresso cups, fondue plates, complete service, bread pot, crockery sets and much more . The ceramic tableware from Bunzlau is of course also suitable for the dishwasher, the oven and the microwave.